Javier de Frutos is having a salad for lunch. For some reason this takes me by surprise. I expected him to be tearing into raw steak, blood dripping down his chin and howling with pleasure after every bite. This polite, friendly, energised and equable person in front of me in an office in the National Theatre isn’t anything like I expected. For some time now, the Venezuelan-born dancemaker has carried a reputation as the baddest boy in dance. Wild, unpredictable and iconoclastic, he somehow combines the furiously creative energy of Ken Russell in his shock-till-you-drop prime with the febrile darkness of Alexander McQueen. Like both, he is simultaneously auteur and showman, Jean-Luc Godard and Cecil B DeMille. The reputation is only half the story, of course, and based almost entirely on his earlier days as a dancer, when he would often perform naked, and an infamous choreographic work – Eternal Damnation to Sancho and Sanchez. Commissioned in 2009 by Sadler’s Wells as part of a programme entitled In the Spirit of Diaghilev, its extraordinary vision of a grotesquely deformed pope and pregnant nuns in an orgiastic rite that included a torrent of obscenity had audiences booing and walking out. The BBC cut it from their Diaghilev programme, which was to have been transmitted at Christmas. But that is old news. Having weathered the storm (just – he had a breakdown following the furore, which included personal threats on his life), De Frutos bounced back with a flamboyant but rather more user-friendly collaboration with Pet Shop Boys, The Most Incredible Thing. He is currently hard at work on the choreography of a new version of Everyman for the National Theatre, directed by his frequent collaborator, and now artistic director of the NT, Rufus Norris. There is a lot riding on this production, mainly because it is Norris’ first as the incoming AD in the wake of Nicholas Hytner’s departure. Having managed to lure Chiwetel Ejiofor back to the stage in the title role and with a text by poet laureate Carol Ann Duffy, Norris is in a good position to start his first season with a bang. De Frutos is pleased to be part of it, but just as nervous as he always is. He first worked with Norris in 2006 on a production of Cabaret at the West End’s Lyric Theatre. Since then, they have collaborated on several productions, including London Road, which De Frutos says “was a great exercise in restraint”. Restraint is not the first word that springs to mind when attempting to describe the choreographer’s work. As an iconoclast and individualist, he has made almost as many enemies as friends. 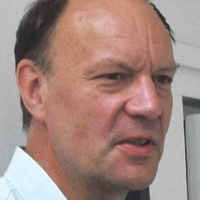 His tenure as artistic director of Leeds-based Phoenix Dance Theatre, for example, was brief (2006-2008) and acrimonious. He has had other fallings out – including in 2001 with Isaac Julien over their Turner Prize-nominated film The Long Road to Mazatlan (a bitter legal dispute over authorship) and in 2007 leaving English National Opera’s production of Kismet a fortnight before it opened. But many theatre directors actively enjoy the push me/pull you collaboration with De Frutos. Phil Willmott of Steam Industry Free Theatre and associate director of the Finborough theatre has worked with him on several productions, including a new version of The Oresteia called The Trojan War and Peace, as well as the Elizabethan play Double Falsehood, allegedly written by John Fletcher and William Shakespeare. Moreover, dancers love the challenge of working with him. Clearly, you need to be on top of your game to deal with De Frutos. But the rewards can be immense. 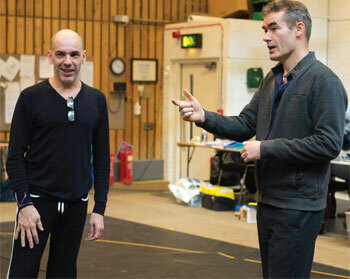 So what is the secret of his enduring partnership with Rufus Norris? Tagging means passing the creative baton back and forth between them in every area of performance – dance, acting, speech – in as seamless a manner as possible. It is based on mutual trust. Such is the nature of their working partnership they can now communicate in shorthand and often complete each other’s sentences. De Frutos says that each new show for him is like “the first day of school”. And for someone who began as an auteur he has developed an extraordinary reach, expanding into many different areas of dance that include West End musicals, plays, rock videos and even commercials. He understands that he needs to wear a different creative hat for each one. At 52, De Frutos is no longer an enfant terrible, yet his hunger for new experiences and risk-taking appears undiminished. His early years as a dancer were characterised by a desire – perhaps need is a better word – to expose himself in order to induce some kind of personal catharsis. Following a year in Barcelona, he returned to London in 1994, where his first UK solo, set to Stravinsky’s The Rite of Spring, made people sit up and pay attention. More often than not, he would end up naked on stage, combining rigorous, hard-edged contemporary dance with mutant burlesque routines. His wide-ranging influences draw inspiration from sources as diverse as George Balanchine and Ethel Merman, Vaslav Nijinsky and Tennessee Williams. Indeed, Williams is his abiding hero. In 1998, when De Frutos had burnt himself out as a performer, he was awarded a fellowship from Arts Council England to research the playwright. He took two years off to travel to America to soak up the atmosphere of Williams’ southern environment. The revelation came – as it often does to those who go there – in New Orleans. “If I can’t write like him I don’t want to write at all,” he says, suggesting he could find an alternative expression of Williams’ themes through dance. 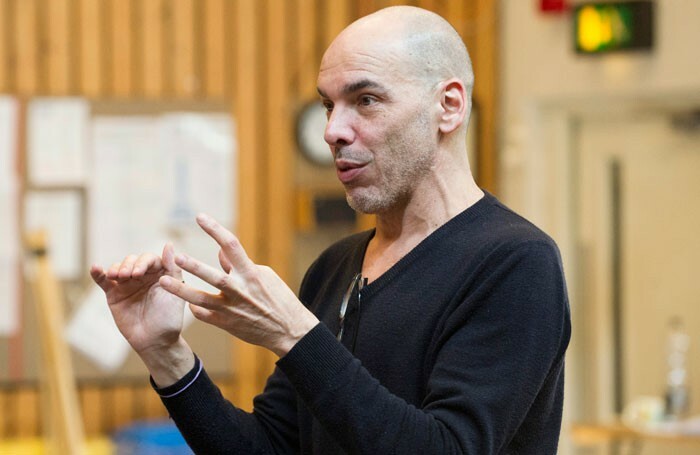 As a result, he started investigating the playwright’s work through dance, choreographing Elysian Fields for Rambert to the Alex North score for the film of A Streetcar Named Desire, while the beautiful but desolate Blue Roses (2007) was inspired by The Glass Menagerie. The Misty Frontier (2001) used a chance encounter between Balanchine and Williams in 1945 to explore the differences in art forms as well as the psychologies of both men. “If you dance to the way Williams speaks, you dance with a southern accent,” he explains. While he has long since put his clothes back on and hung up his dancing pumps, his work as a choreographer is as exciting and unpredictable as ever. Strangely, the nervousness and anxiety that forced him to stop dancing remains with him as a choreographer. It occurs to me that it may be fear that keeps him going. The reasons behind that fear are harder to pin down – failure? Standing still? Atrophy? – but he constantly refers to his own feelings of intimidation and discomfort as if they were catalysts for his creativity. Which is possibly why Everyman holds a particular appeal. This open-minded approach to dance and theatre allows him to have creative dialogues with both actors and dancers. Chiwetel Ejiofor may be a multi-award-winning actor, but he is not a dancer. Yet in Everyman, he is working opposite Clemmie Sveaas, who is a dancer and can also act and sing. Clearly, De Frutos derives a great deal of satisfaction from his work, in spite of his claims that he is never happy with it. This has been at the expense of his personal life, much of which drove him to examine or exorcise his personal demons in his early works, which examined themes including Catholicism and homosexuality and were full of blood and mystery and beauty and death. He looks at his plate as if surprised to find it empty. Rehearsals for Everyman are summoning him back. It’s business as usual for De Frutos, who is something of a multitasker when it comes to dance. And he has been recognised and rewarded, as well as reviled. This is a man, a creative force of nature, whose journey through the dance/theatre world has not always been smooth, but whose work has a brutal purity about it that is undeniable and who is not overly impressed with himself.